Curly enjoys crafts and little art projects, so we were excited to review a lapbook from In the Hands of a Child. 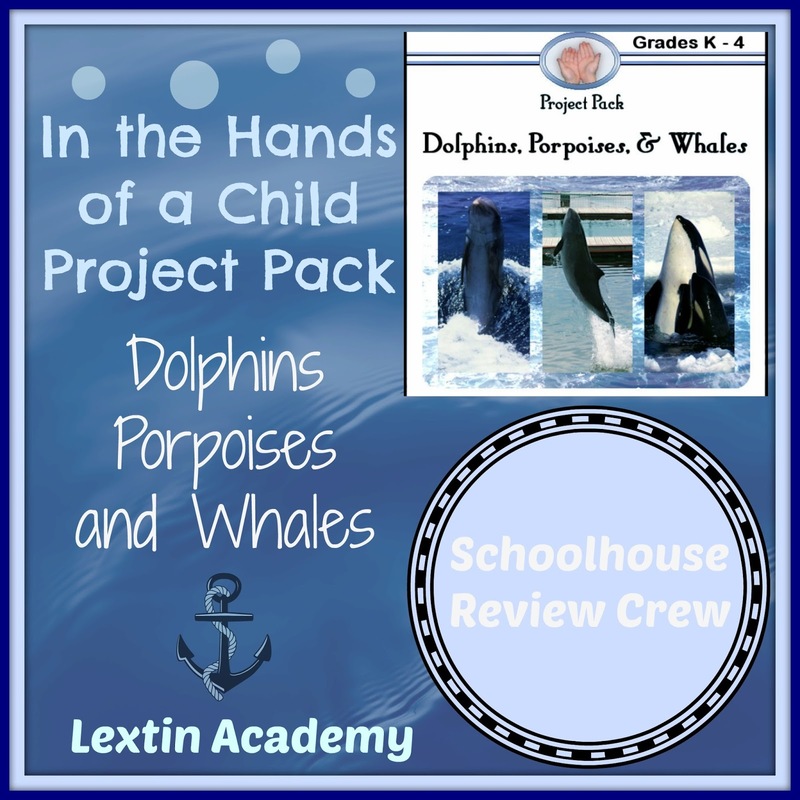 We chose a lapbook about Dolphins, Porpoises, and Whales since we live near SeaWorld and have the chance to visit there often. In the Hands of a Child produces lapbooks and notebook pages to enhance unit studies in a wide variety of subjects such as science, government, history, art, literature, and math. They also offer products to complement holiday studies such as Christmas, Easter, St. Patrick’s Day, and Passover. What are notebook pages? These are blank pages with graphics that correspond to the subject being studied. These pages have blank areas for drawing or lined spaces to write about what the student has learned. The notebook pages offered by In the Hands of a Child are blank templates for the student to complete throughout the year, creating a notebook of all the topics studied that year. What are lapbooks? Lapbooks are like interactive notebook pages – think of them like scrapbooking. Lapbooks have different elements to color, cut out, and paste into a file folder. There are vocabulary cards, miniature books, and books that have flaps to lift and open. Inside each element are words or graphics, illustrating information about a certain topic. Some lapbooks for younger children are complete with words about the topic so they need only color, cut, and paste. Lapbooks for older children require them to do their own writing and take notes in the small books that are then compiled into a display within file folders. Lapbooks allow the students to have an interactive record of what they learned about a certain topic. In the Hands of a Child offers project packs which include textual information, printable lapbook pages, additional reading list, and project and activity ideas for each topic. These project packs are small unit studies that have everything included! The e-book version is normally $12 and the CD version is normally $17. The first pages of the Project Pack has a table of contents which outlines all the pages and printable pages within the pack. The next page has a 7-day schedule which shows what pages to read, what vocabulary words to learn and review, and what printable pages to complete each day. There are instructions for cutting and assembling each printable lapbook component as well as instructions for assembling the file folders for the lapbook. And thankfully there are pictures of the completed lapbook if you need a visual guide of a completed lapbook. Project Packs contain a Research Guide. This guide contains all the lessons needed to complete the entire project pack. This is the text which contains information about the topic, divided into several chapters, which can be read by the student or to the student. There is also a list of recommended books and websites for further exploration. A glossary of all the vocabulary words is also included. The majority of the project pack is the printable lapbook elements. There are multiple pages of various templates that require cutting, coloring, gluing, and some require the student to write information on them to complete them. Curly and I completed this product together! We loosely followed the schedule – we did each day over a two-day period as we were also doing many other school subjects during this time period. This meant less cutting and pasting each day for Curly so she felt like she could take her time on each lapbook component. And this lapbook has tons of information so it was easier for us to digest it at a slower pace. We learned the definition of the word “streamlined” and how it applies to dolphins, whales, and porpoises. We also reviewed other vocabulary words that we learned from earlier lessons. This was the intro to our reading of dolphin anatomy. We learned the various parts of a dolphin and we looked at some pictures online of real dolphins and Curly practiced pointing out their different body parts. Then we did two lapbook components. 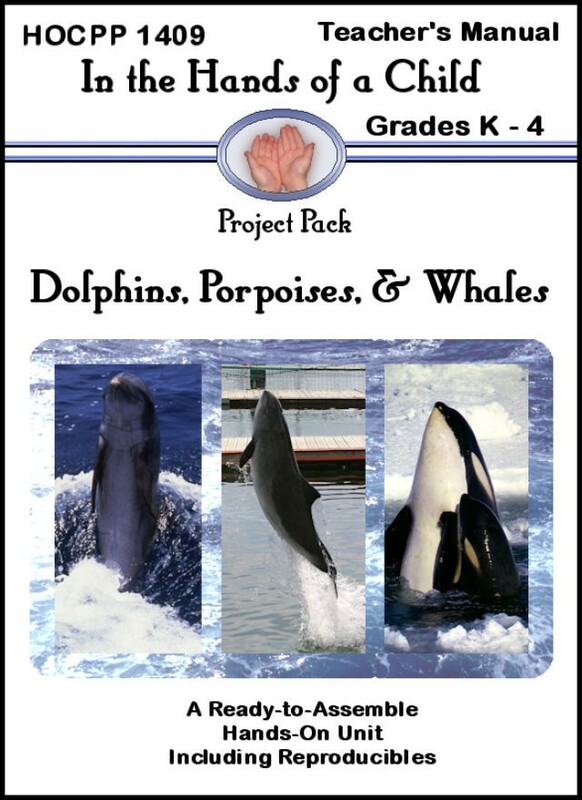 The first component was to create a dolphin book. Curly made up a short story about a playful dolphin and then I wrote out her story for her. She illustrated the pages and then we stapled our book together. The second one was to label the parts of a dolphin. Curly cut out each name and placed it in the correct place on the dolphin diagram. Then she glued them down and colored her dolphin. The one problem I had was that I was not sure where to place all the lapbook elements once they were cut out. I wasn’t sure in what order to glue them on the file folders. I would have really appreciated a placement guide that showed me where each element would best fit. We had to play around with the items to make them fit in the best way. It felt like a puzzle! The picture of the completed lapbook was not the same lapbook that we were completing. So, after studying that lapbook and trying to figure out placement of lapbook elements, I realized that they were not the same and that I would not be able to use that as a guide for completing my lapbook. Lapbooks require a lot of printing unless you buy a pre-printed version. You will need some paper and ink and you might even want some colored cardstock for printing. My husband doesn’t love when I print tons of printables and burn through our ink cartridges………but at least this e-book is black and white so I didn’t use colored ink!! There are lots of elements to cut and paste and keep track of while you’re working. If your house has little people like mine does, you might loose some of the elements and have to start over! (That only happened twice……..). So, if you plan to lapbook you need to have a storage idea in mind as you’re working on them! I love that all the necessary reading to complete each element is included in the Project Pack! I was able to start this pack right away without reserving books at the library and planning a time to pick them up! I didn’t have to hunt down any outside resources that were necessary to complete this pack. Everything is included! That is so very nice! Curly enjoyed the black and white pictures that she was able to color to make the lapbook her own. She also loved the elements that already had text so she needed to only cut them out and glue them onto the correct place. It didn’t require a huge amount of writing which is a big plus for the young elementary age group who are not ready to do a lot of writing. There is a lot of information covered in this lapbook but it was easy to pick and choose what we wanted to cover without feeling like we were missing anything. We left out a few of the more difficult vocabulary words and still had a wonderful learning experience. The instructions for each lapbook element are very helpful! I needed all the detailed instructions for the various lapbook elements to know where to cut and where to glue and how to fold. I was thankful for the schedule which helped me break up the lapbook project into doable amounts for each day. We’ve tried lapbooks before and quickly burned out because we tried to do too much at one time. I found the schedule very helpful and it was simple to even slow the pace of the lapbook down further, spreading it over 2 weeks instead of just 1 week. If your child enjoys coloring, cutting, and pasting then lapbooking may just be perfect for your homeschool! Also, if you’re a wannabe unit study mom (but hate gathering resources, books, and searching out websites and cute printables – like me) then you will love these short but indepth unit study Project Packs that have done all the work for you. We enjoyed our Project Pack and plan to do a few more this school year. We’re going to go for a holiday study next!! Read the Crew reviews of other lapbook products here! I am making a note to do this project when we do Apologia Zoology 2. Great review!